Size: 9.4" x 8.3" x 2.4"
The €-2005 calculator combines the usual printing desktop calculator functions with an Euro currency conversion and a convenient tax functionality. All of the 11 yet defined exchange rates are preprogrammed in the calculator, 4 additional ones could be added later. The home country is selected with the Select-key. Two additional keys allow the conversion in both directions. Dismantling the €-2005 reveals a clean and simple construction based on the Toshiba TC-83230 single-chip printing calculator circuit. It is connected directly with the printer-mechanism, the LC-Display and the keyboard contacts. The featured calculator was manufactured in China for the European market and is powered with 220 volts. The Date code suggests that Leo Electronics Co., Ltd., a Japanese manufacturer of electronic equipment, assembled the €-2005 in its Shenzhen, China facility. Texas Instruments introduced with the €-2004, €-2006 and €-5032 three printing siblings in the EURO-line. 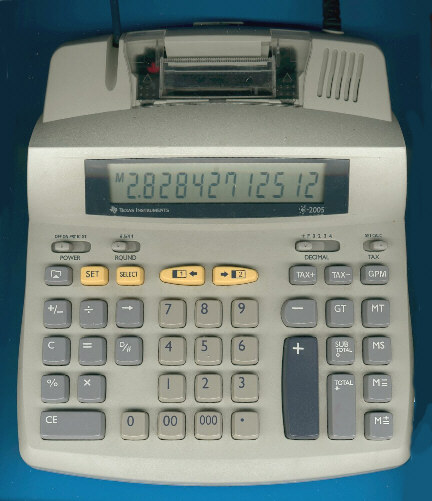 Non-printing desktop calculators with Euro conversion capability were introduced with the €-1796, €-2002+ and €-2003. Read more about the Euro here. In 2006 Texas Instruments surprised customers in Europe with a complete new family of Euro Calculators labeled EC-3, EC-5 and EC-7 Pro. © Joerg Woerner, November 14, 2003. No reprints without written permission.